The annual Golden Wedding Anniversary Celebration was held at the Four Seasons Hotel for Boston couples together 50 years or longer. When Jim Sheehan looks back on 50 years of marriage to his wife, Patricia Sheehan, he marvels. They recently celebrated their anniversary at Fenway Park. “How did we do it?” the 82-year-old asked his wife with a sheepish grin. She smiled back and shrugged. When they met, he was a redhead, which was the first thing Patricia noticed about him. He was also cool and hip, she said. He still is. Funny, too. “I noticed that she was very beautiful and anxious to date me,” Jim said. His wife gave him a look. “Well, I was beautiful,” she said. The rest she couldn’t vouch for. He brought four kids into their marriage, and she brought three. They both brought baggage, she admitted. They survived tragedy, including the loss of their youngest, but have supported each other through it all. 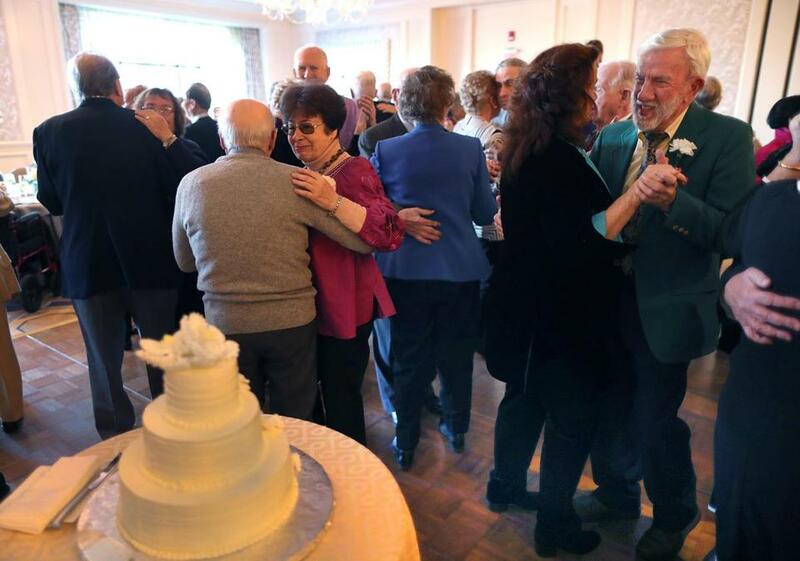 On Tuesday, the Sheehans celebrated their journey with 74 other couples who’d been together for at least 50 years at the Boston Commission on Affairs of the Elderly’s annual Golden Anniversary Celebration. All couples received certificates signed by the mayor, champagne flutes, and ate lunch and dessert at the Four Seasons, while enjoying music and dancing. It was the event’s 40th anniversary and the commission’s 50th anniversary this year, which meant there was even more to celebrate, said Emily Shea, commissioner on affairs of the elderly. Since the event’s inception in 1979, close to 2,000 couples from all over Boston have been honored. The couples at the event Tuesday had tallied more than 3,992 years of marriage. Rich and Jane Appleman cut the cake together — not because they’d been married the longest, but because their anniversary date was the closest. In a few weeks, they plan to be on a ship cruising through the Panama Canal. They met on a blind date in April 1968. He was a musician in the Navy stationed in South Boston. She was a brilliant cook and a student at Simmons College. When it comes to marriage, many couples agreed with James Raynor, 73. There is no secret. He met his wife at Northeastern University. He was an upperclassman studying biology coming to have lunch at the school. She was a freshman studying sociology. They danced together at the Four Seasons event, him singing along with the band, her laughing at his antics. Peter Eng, 77, met his wife in Hong Kong before they moved to the United States. “We cared about each other,” said Andree Eng, 72. That’s no secret. Fifteen years ago, Peter had open heart surgery, prostate cancer, and a hernia all in one year. She stayed by his side, helped nurse him back to health. He said in Chinese that if it weren’t for his wife, he wouldn’t be here. In English, he summarized his feelings for Andree in three sentences. “I want her. I need her. I love her,” he said in English.